With the number of overweight and obese children on the rise, many parents and caregivers are interested in learning about healthy diets for kids to lose weight. When adults are concerned about their weight, it is common for them to consider going on a "diet" in order to help shed those extra pounds. However, it is not recommended that children be placed on a diet at any time. Not only can the wrong type of diet end up limiting important nutrients kids need to grow, it can also lead to misconceptions about health for the child. Yet, there are plenty of things you can do to help your child to achieve a healthy weight. It is important to remember that discussing your concerns about your child's weight can result in serious lifelong self-esteem issues. If you are worried your child may be overweight, don't discuss it, do something about it. Make an effort to provide healthful foods such as fruits, vegetables, whole grains, beans, low-fat dairy products, and lean meats to your family. Keep foods high in calories and low in nutrients such as soda, chips, candy, and other processed snack foods out of the house. Plan for the family to eat together as often as possible and encourage all members of your household to consume a well balanced diet. Search the Internet and cookbooks for healthy meal ideas. Having children help you prepare their meals is one of the best ways to spark their interest in healthy eating. Older kids can chop veggies and shred cheese. Younger children can wash vegetables and measure out ingredients. Try having a build your own burrito or pizza night where kids have plenty of options for creating their own healthy meals. Kids can also help to make their own school lunches. Have them include their choice of at least one fruit and one vegetable in their lunchbox. 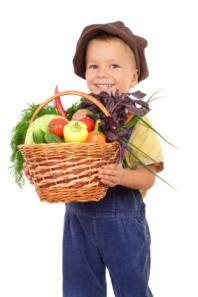 If kids are able to choose their own fruits and veggies, they are more likely to eat them. One of the best ways to help your child achieve a healthy weight is to increase the amount of their physical activity. Find ways for the entire family to exercise together. Turn off the television, computer, and video games. Get everyone outside. Go for hikes. Walk to a local park or library or simply go out into the backyard and play. The worst thing you can ever do is to blame, scream, threaten, or bribe your children when it comes to their weight. Do not turn food or weight into a battleground at home. This can lead to major problems in the long-term including eating disorders. Remember the best healthy diets for kids to lose weight are not "diets." Learning healthful eating and exercise habits is the best way to ensure your children will achieve and maintain a healthy weight for a lifetime. If you need help with meal planning, a [www.eatright.org Registered Dietitian] can help you. Remember to speak to your child's doctor if you are extremely concerned about your child's weight.